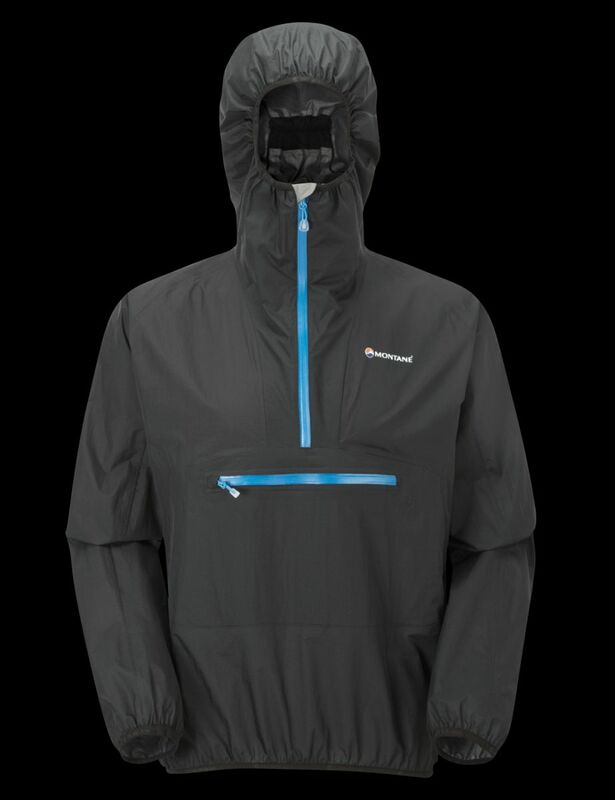 Few waterproofs have had such an effect on the UK trail scene as the Minimus range from Montane®. Based around being as light and compact as possible, for stuffing in your pack or wearing when tearing down the fell side. The Minimus Smock is the epitome of stripping everything back to the bare essentials. Gone are drawcords, full length zips, adjustable cuffs, regular sized seam taping and hooded peaks. This is an out and out race bred machine. Yes, you may want something a little heavier weight for a Scottish winter, but for running and walking, there is no excuse not to carry it. The question is how can you make something so protective and breathable, yet so light? PERTEX® is the answer. 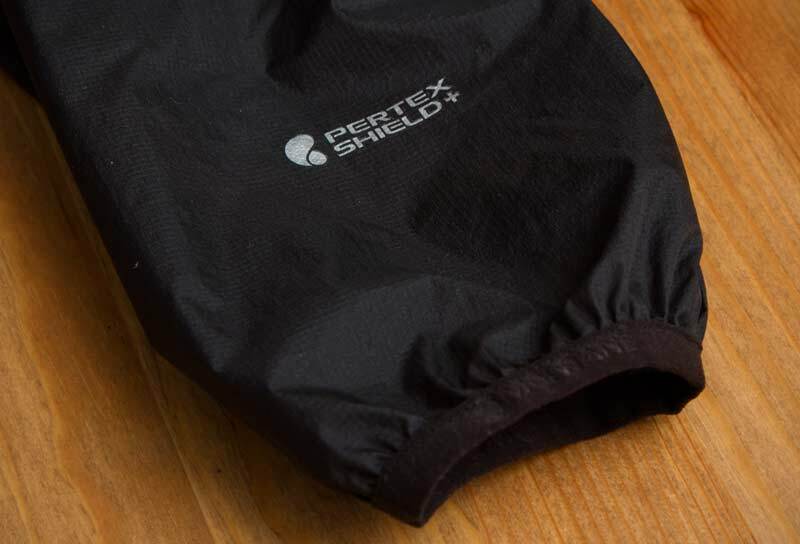 The Minimus Smock is constructed from PERTEX® Shield + fabric which is incredibly breathable and fully waterproof. At a 15D+40D denier, it is super fine yet resilient when the trail bites back. For the stat geeks out there it features a 25,000 MVTR with a 20,000mm hydrostatic head. The reality; a jacket that is barely noticeable when on, breathes extremely well when wet or dry and takes up little space in your waist pack or vest. At roughly 146g for a medium (mines a small so can’t test this stat) it’s no potato couch and weighs a similar amount to a lot of windproof jackets on the market. Often in the past such lightweight fabrics felt like vinyl and stuck to you like a quick bond adhesive. Fear not! This is not the case with PERTEX® Shield +. I wore this when riding and running up steep ascents and it didn’t stick to me nor feel clammy. It’s pretty amazing. Instead of regular taped seams, the Minimus features Micro-tapes. These increase the breathability, as there is less taping on the material, as well as aiding compaction. Often waterproofs can ride up when on the going gets vertical. Raising your arms drags up the waist, exposing your skin or under layers to the elements. The Minimus features articulated arms, which reduces the likeliness of this occurring and I can tell you from first hand experience they do the job! The cut it also athletic, keeping the risk of excess material minimal flapping in the wind or getting snagged. Minimal for a Minimus. The hood has a stretch elastic edge, which pulls it in close to your ugly mug. This means no need for a drawcord, and if you are taking this somewhere where you will need a helmet, you can wear it underneath. The back of the hood also features a pre-shaped elastic tensioner, meaning it will hug your head as soon as you put it on, rather than faffing around for that perfect fit. Now, a peak may have been a nice addition to keep the rain out of your eyes and this is something I know notice more having started having to wear glasses. 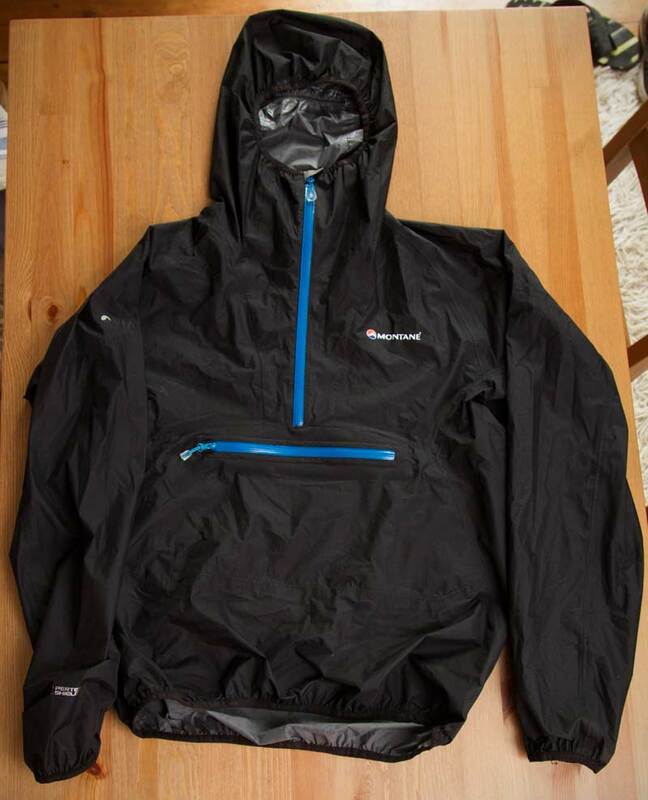 For those who want all the features but with a hood, I suggest looking at the Montane® Minimus Jacket. However, for racers out there, a hat of some description is mandatory in most races, and this is where the Pace Cap comes into play. The Pace Cap is constructed from 3 layer Hurricane eVent®, and offers a much greater field of view and protection than you will get from a traditional wire peaked hood. So there are two solutions to your conundrum. And of course, a wired peak would reduced the compactible size of the Minimus Smock. The front pocket is great. Big and simple, it can take maps, sunglasses, gloves, phone, food….anything that you want to hand. A YKK Aquagaurd® keeps the rain at bay. I found my favourite thing to slip into this pocket was glasses for low light runs. With the cut of the top, they didn’t bounce around causing a distraction. 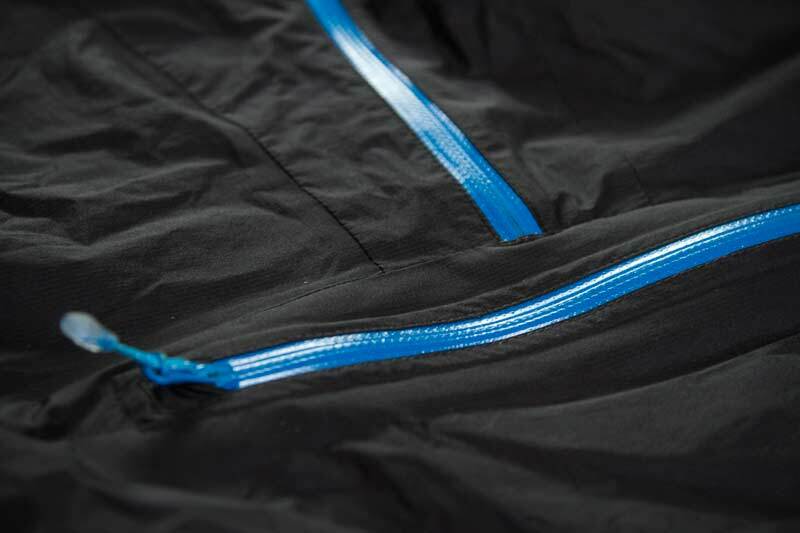 The half length YKK Aquagaurd® front zip holds off natures furry, and if things are turned up to 11, there is a internal storm flap behind it. Given that the human body is the downfall as we heat up and cool down, the zip aids heat regulation. The zip isn’t stiff and due to being only half length, lends itself to one handed operation. The cuffs are stretch bound, so no messing around with Velcro cuffs when every second counts or cold hands struggling to do those basic tasks. They do a fine job of keeping rain at bay, don’t let their basic appearance deceive you. They are also brilliant if you are running a little hot don’t want to take the smock off. The sleeves will easily pull up to your elbows, unless you have arms like Arnie, which adds to the versatility. The hem is also stretch bound, so you simply pull it on and run, rather than adjust. It is tight enough to keep rain and wind out, no matter how ridiculous the angle it seems to be achieving, yet not so tight it is anyway uncomfortable or restrictive. VIA trail stealth logos (I’m calling them stealth as they are very subtle) are also reflective, which breaks away from the traditional tendency to make all things reflective silver. A nice touch, given the entire jacket other than Montane® logo is black. 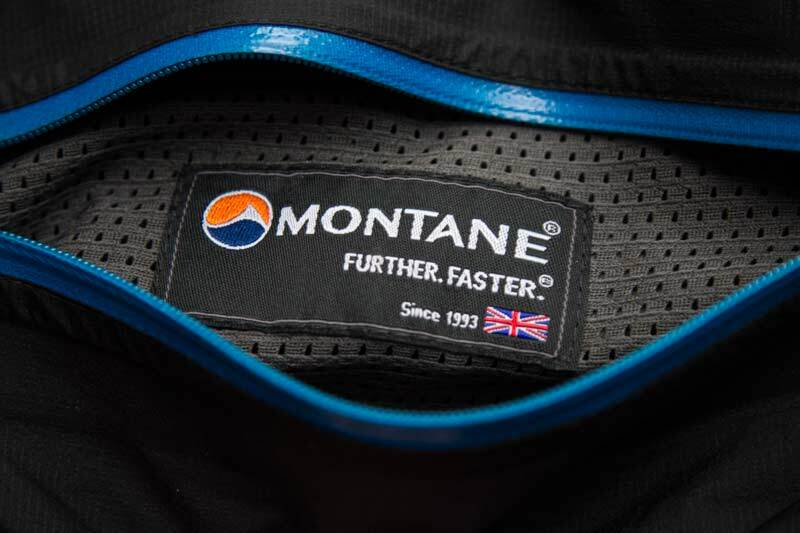 A MONTANE® stuff sac is supplied, perfect for storing the jacket in your pack, but to be honest I have never used it. I’m too lazy and disorganised to pack it and simply stuff it into an available nook and cranny in my chosen pack. I’ve worn this running around my local trails, mountain biking in Peebles, Cairngorms and Fort William and running on Ben Nevis. It accompanied me on the Howgills Mountain marathon and Ox race weekend. I take it everywhere! 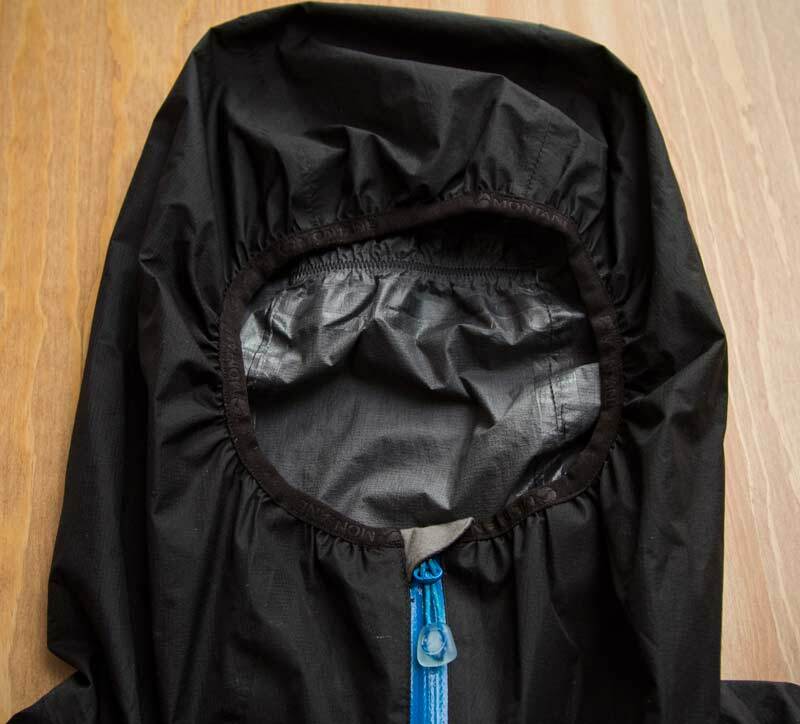 I’ve used it as both a windproof layer and waterproof, alone and together. It’s kept me dry and cool when precipitation has fell, and saved me from copious amounts of mud when on the bike. I love the styling. Simple, functional but effortlessly classic. The elastic hem, cuffs and hood work perfectly and show that if done correctly there is no need for Velcro adjusters. The pocket fits all you need and it is so light you think you’ve picked up a piece of waterproof material, not an entire jacket! Would I like a peak to the hood. Yes. Is it a deal breaker. No. And that’s all I can say really. This has become my go to waterproof for trail use and that’s testament enough to what it has to offer. The combination of PERTEX® Shield + and well thought out technical details have created an Atomweight which strikes like a heavyweight.